If you are looking for an alternative to wrapping paper, I have some solutions that are creative and eco friendly. 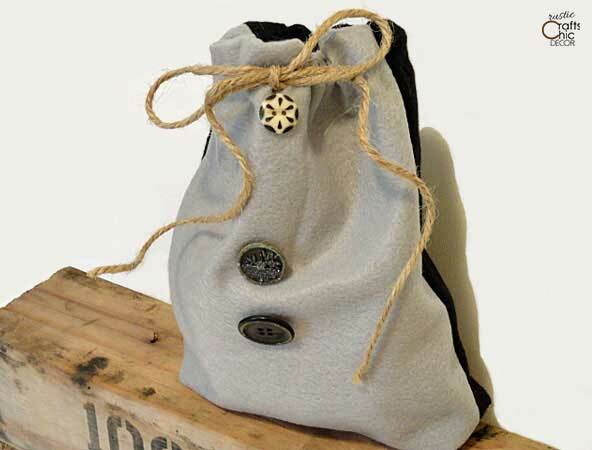 Eco friendly gift packaging ideas include reusable packaging and wrapping with recycled items. I like to recycle whenever I can because it eliminates some waste and is a great cost savings. However, just because I am using items that may otherwise end up in the trash does not mean that I will be skimping on style. In fact, many times the style can be all the more chic or rustic depending on the materials used. 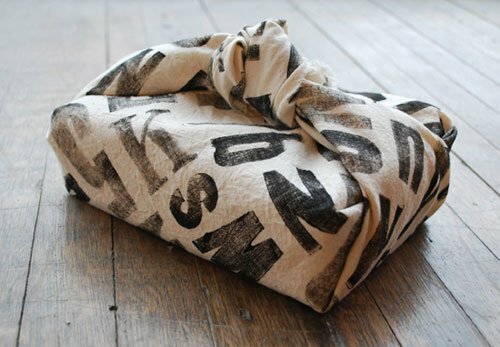 Below are some great examples of eco friendly gift packaging ideas that use recycled fabric, paper or other items in stylish and creative ways. I just made this felt gift bag with some scrap pieces of felt that I had on hand. Recycling old buttons, for interesting embellishments, is also a great cost savings that doesn’t skimp on style. You can buy these brown paper bags in bulk pretty inexpensively but embellishing them is the key. 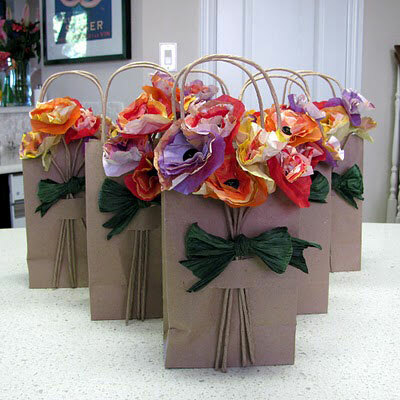 These bags were made eye catching with the pretty eco friendly flowers made from ordinary packing paper. I found this idea on Pinterest and just had to share it. It looks super easy – the bag wasn’t even turned right side out after stitching! It almost looks like a long piece was folded in half, stiched on the sides and then the top was cut with pinking shears so that it would not ravel. I love the rustic look, especially with the clothespin clasp! 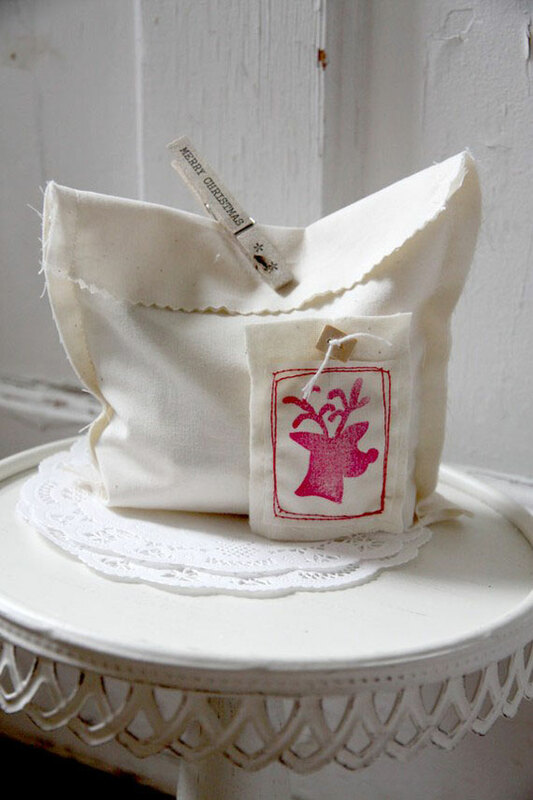 A cute embellishment tag was added by simply stamping another small square of muslin and tying it into place with a small section of twine. 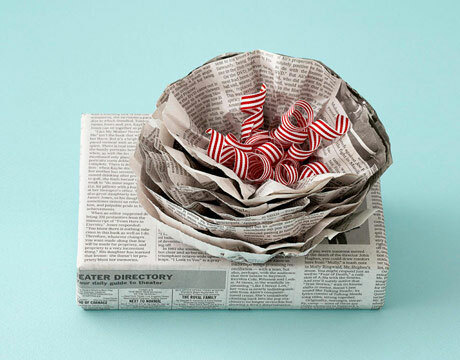 Nothing is more recyclable than newspaper and the way this is presented, with the flower focal point, it looks like high end packaging! I like the idea of using fabric scraps for wrapping. With all the unique patterns, you can really have some interesting design options to present. If you only have plain fabrics, you can always paint or stamp a pattern onto the fabric like what was done here. Make sure to check out my post on Gift Wrapping With Lunch Bags And Kraft Paper for more eco friendly ideas. These are really cute ideas for packaging! My favorites are the felt pouch and the bag with clothes pin.